When an astrophotographer embarks on his/her journey of using a telescope to practice more serious astrophotography, he/she tends to start with an already-owned DSLR. These cameras can range from amateur photographer quality to professional photographer quality, with a lot in-between. The main idea here is simple - the DSLR would be used without a lens and the telescope in effect becomes the lens. The most popular manufacturer of DSLRs used for astrophotography is, by far, Canon with their EOS line of DSLRs. The reason astrophotographers tended toward using Canon EOS DSLRs rather than their Nikon equivalents was purely due to Canon using more sensitive CMOS sensors with lower noise. Since deep space targets are generally extremely faint and require very long exposures to capture, Canon EOS DSLRs were favoured for being able to capture more deep detail in lower exposure times, with less noise plaguing the images. This favourable choice led to much of the software used for astrophotography being tailored to communicate with Canon EOS DSLRs and not their Nikon equivalents. For example, Canon EOS DSLR users can nowadays enjoy software such as Backyard EOS to fully control their DSLR for astrophotography. Needless to say however, many users do not own Canon EOS DSLRs and may indeed instead own a Nikon DSLR. Nowadays there is no issue finding telescope adapters for either, or even for simpler cameras. 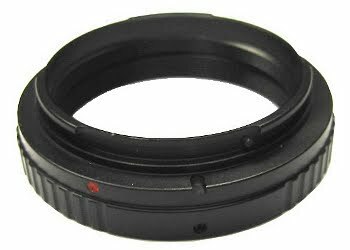 There are a few ways to connect a DSLR on to a telescope, but all generally involve removing the lens from the DSLR and connecting instead an adapter, to then go into the telescope focuser. The most common and best way of achieving this, is a simple bayonet ring (identical to the rear connecting bayonet of a camera lens) that has a 1.25" or 2" barrel. This ring's bayonet will thread into the DSLR (in place of a lens) and provide the necessary 1.25" or 2" barrel (common telescope focuser sizes) to literally plug the camera into the telescope focuser and lock it in place. Focusing is then done using the telescope focuser's focus knobs. There are other sizes of course, such as one providing a 2" thread, which is M48x0.75. The idea is that these adapters add the same distance to get to the CMOS sensor as any common DSLR lens, making it a simple and repeatable process of mounting the DSLR on the telescope and focusing it. It is noted however that because the CMOS sensor lies 4.5 cm (or 45 mm) into the DSLR body (for Canon EOS DSLRs), the DSLR needs to be mounted as close as possible to the outer barrel of the telescope focuser. Mounting it too far out prevents the astrophotographer ever reaching focus as you need to get closer. In the example shown above, the setup on the left allows the DSLR to reach focus by focusing out a bit with the telescope focuser. The setup on the right however does not focus because it starts off too far away to reach focus and the DSLR cannot get closer. The focal point is defined as the precise point where the light coming in is focused. The distance light has to travel to reach the focal point depends on the optics used but the distance from the front of the DSLR and the actual CMOS sensor has to be taken into account - this being 4.5 cm (or 45 mm). 1. Sensitivity: The DSLR sensors are not built for very long exposures of very faint targets. They have fairly low quantum efficiency (a measure of how sensitive the sensor is to incoming light of various wavelengths, to produce an electrical signal). 2. Noise: Since DSLRs are built for terrestrial photography and of generally bright targets, noise is not a big deal. The electronics of the DSLR produce noise in their own right and the sensor is allowed to operate at room temperature and to heat up during operation, without temperature control. The higher this sensor temperature, the more thermal noise it produces. Again, for images of bright targets with low exposure times, this is not a big deal. 3. IR Filters: Everyday photography is meant to capture the same spectrum that we see with our eyes - the visible spectrum. Wavelengths of light that lie outside of this are therefore a nuisance. DSLRs have two filters between the lens and the sensor, blocking mainly infrared light coming in. Unfortunately, much of the light from deep space (particularly nebulae) lies in this part of the spectrum due to the light commonly emitted by Hydrogen (the most basic and common element in the Universe). Several years ago, Canon identified that there was a market for astrophotographers, who actually ventured into removing these IR filters within their Canon EOS DSLRs (doable with guides like this one). Canon then took their EOS 20D DSLR and produced an alternate version of it, the EOS 20Da DSLR. The a was added for astronomy and the only difference between the 20D and 20Da was the fact that in the 20Da, Canon removed the IR filters and instead added a filter produced by Baader (a common manufacturer of astronomical filters) that allowed through the much-sought-after light from deep space. Years later, these were replaced by the 60D and now standard 60Da. What Canon never addressed however, and has not bothered to date (as it would require a major re-design of their product line), is the fact that their DSLRs still produce a lot of noise and lack sensitivity for use in professional astrophotography. Given the price-point, the Canon EOS 1100D is today's most commonly used DSLR for astrophotography. Best of all, since the price is not very high, people who buy them for use in astrophotography tend to not mind so much opening them up and removing the IR filters themselves. Due to the popularity of this DSLR, some companies dedicated themselves to fixing the second issue listed above - the noise. JTW Astronomy is one such company, who provide an online store of modified Canon EOS 1100D DSLRs that have been completely taken apart in order to place the electronics within a custom-made casing with a Peltier cooling system. This system also requires a 12V source of power (like the mount, for example) and requires that the user operate the camera strictly via USB on a laptop (using software like Backyard EOS). Their customised DSLRs also include removal of the IR filters, thus addressing the third issue as well. The increase in performance is tremendous, producing extremely little noise even at very high ISO and long exposure times. Ultimately it is up to the user whether or not to invest in such a customised DSLR. There are very, very clear advantages to doing so, but the prices approach the prices of dedicated astronomical CCD cameras and these actually overcome the problems by design from the ground-up. 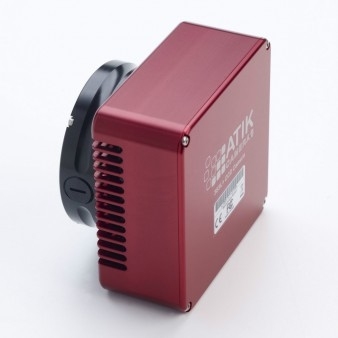 This CCD camera uses the popular Kodak KAF-8300 CCD sensor that has become a big hit with astrophotographers, as it provides a high quantum efficiency and large size (8.3 MegaPixel) for fairly low cost. 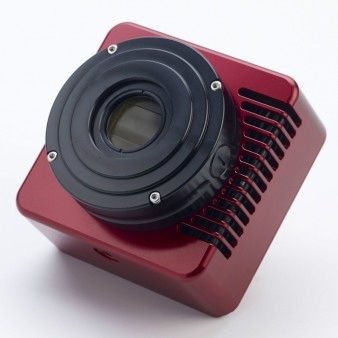 The CCD camera simply features the CCD sensor, situated behind a shutter and a clear optical window (to seal the chamber), basic electronics and a Peltier cooling system that makes up the bulk of the camera's size. 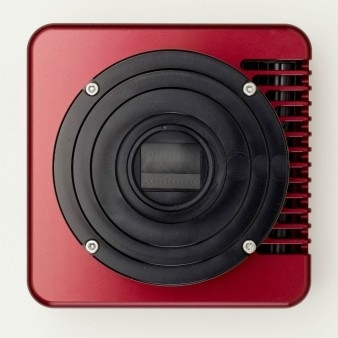 This cooling system is able to cool the CCD sensor to 40°C below ambient temperature. Even on a nice summer night in Gibraltar, reaching CCD sensor temperatures of -10°C is not a problem. This makes for extremely low noise compared to ambient operating temperature and couple it with little electronics, high quantum efficiency and no filters and you have an tremendously useful camera for astrophotography. Attaching an astronomical CCD camera to a telescope is designed to be perfectly simple as it is the camera's main purpose. The ATIK 383L+ seen above, for example, has a standard T2 (T-Thread, M42x0.75) thread on the front that will screw on to common astronomical accessories. Adapters also exist to convert this into any other thread size required. We note that all astronomical CCD cameras are based on these same underlying principles, though some are more sophisticated than others. Some have larger CCD sensors, some have smaller CCD sensors, some have smaller pixels (making for more dense CCD sensors), etc. The cooling system also varies from one to another - some allow the temperature to be set to 0.1°C accuracy and others are only switched on and off, reaching a certain temperature by ambient conditions (rather than by the user setting it). Generally speaking, astronomical CCD cameras are powered by a 12V input (like your mount) and are controlled entirely through a laptop via USB. Software is supplied to control the cooling system and exposures, which are downloaded straight on to the laptop and stored there as they are captured. Third-party software also exists, of varying quality and capability. ATIK in particular produce amazing quality CCD cameras and have absolutely fantastic after-sales support service (speaking from experience). QSI also produce CCD cameras of incredible quality. 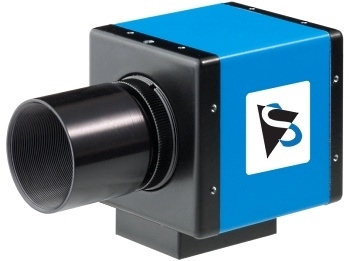 There are other big manufacturers of quality CCD cameras, including SBIG and Starlight Xpress. A further advantage of using an astronomical CCD camera rather than a DSLR is that the CCD camera can be purchased (for the same price), as monochrome. Exposures captured with monochrome CCD cameras are, by definition, not colour and instead encompass the entire spectrum (subject to the CCD sensor's spectral response - how sensitively the CCD sensor responds to light of different wavelengths) in a greyscale image. The reason this is an advantage is a technicality that will be discussed in due course. In a colour camera, whether astronomical CCD or DSLR, the sensor is identical to that of a monochrome camera, except for a minor difference - there is a Bayer Filter over the sensor. This Bayer Filter is essentially a filter of tiny micro-lenses of Red, Green and Blue, filtering the light coming in so that Red light falls on particular pixels, Green light falls on other pixels and Blue light falls on other pixels. You will notice immediately that for every square of four pixels, one is Red, one is Blue and two are Green. This means that for a colour camera, a quarter of your sensor detects Red, another quarter detects Blue and the remaining half detects Green. This does require the camera to scale down the Green light in order to make a realistic colour image. What is important to note here is the spatial resolution. Imagine that your target is mostly red (within the visible spectrum) because of the massive amounts of light emitted from Hydrogen (this is common!). In effect, you are wasting 75% of the sensor's imaging resolution by using a colour camera. This is, in essence, making the sensor less sensitive to the light you are interested in. Monochrome cameras therefore provide a much better spatial resolution, using the entire sensor to image every part of the spectrum, which can be later combined in post-processing into a colour image. The way the light is filtered is using astronomical filters that allow light of different parts of the visible spectrum. These filters will be covered in detail in a later section. Not only does this allow the astrophotographer to produce colour images of increased spatial resolution, but it also allows the use of narrowband filters, which select out a tiny, tiny portion of the spectrum (could be in the infrared) and therefore allows the creation of images of all kinds of things (including images that effectively map out where certain elements, like Hydrogen and Oxygen, lie within nebulae). The sole disadvantage of buying a monochrome camera is the fact that the filters must then be bought separately. Moreover, DSLRs are not manufactured as monochrome so astronomical CCD cameras are the only option (unless companies such as JTW Astronomy customise a DSLR for you). We note, from above, that the CCD sensor is more sensitive to green light than to the rest of the spectrum. This is very common and in effect, if you were to capture exposures of equal length in Red, Green and Blue, you will notice after colour-combination that there is a Green tint to your image. This is simply because more light in Green was captured. Post-processing can fix this by scaling down the Green channel but this can also be prevented by adjusting your exposure time so that they proportionally agree with the spectral response of your CCD sensor. In an earlier section, we covered the fundamentals of telescopes and how focal length and therefore focal ratio lead to varying field of view. The fact of the matter is that the telescope, being the camera's lens, defines how much of the sky is visible but the CCD sensor on the camera defines how much of that visible sky is captured in an image. The larger the CCD sensor, the more of the visible sky can be captured. However, the pixels on the CCD sensor have a specific physical size, usually measured in micrometres (µm). These are, in essence, the size of the bins where particles of light can fall in and cause an electrical signal. If the size of each bin is smaller but the number of them is fixed, then naturally the CCD sensor will be smaller in physical size. Conversely, if the size of each bin is larger but the number of them is fixed, then the CCD sensor will be larger in physical size. This has increased the field of view significantly, as expected. Conversely, it has also decreased the resolution and our image of the Great Orion Nebula will have less fine detail. As expected, the larger the field of view, the lower the resolution, as we capture more arcseconds of night sky in each pixel. Conversely, the tighter the field of view, the higher the resolution, as we capture less arcseconds of night sky in each pixel. It may be tempting to want the highest resolution possible (unless you want to specifically do wide-field astrophotography). There is however a theoretical limit to how much resolution one can achieve and this is dependent on the night sky above you. Light pollution as well as atmospheric seeing and transparency place a limit on resolution. Mathematics (Nyquist Theorem) dictate that you should aim to have half or even a third of the seeing limit to capture fine detail. For example, if your seeing limits you to 4 arcseconds, then your imaging system should ideally image at 1.33 arcseconds per pixel (a third) to 2 arcseconds per pixel (a half). Of course, you cannot control this from night to night. Your telescope is fixed, even with its focal reducer in place, and your CCD sensor is even more fixed. Unless you have dozens of telescopes and dozens of CCD cameras lying around, you are not going to be in any position to finely choose your imaging resolution from night to night. A good way around it however is to find out the seeing of your proposed imaging sites for a number of typical clear nights and find an average. Use this to dictate what telescope and CCD camera combination to aim for. Ultimately however, it is not a problem if your resolution is higher than allowed by seeing so carrying out this process is not critical as typically, you will not run into massive resolution problems. Of course, different products are different and you will find that it is not as simplistic as above. This is because for our examples, we assumed the resolution was left at 3362 x 2504, but no doubt this will change from camera to camera. Mind you, if they are very similar, the effects described above may be observed. The reason this is a separate sub-section is because of a simple fact - the planets and the Moon are very bright targets and do not require long exposures like deep space targets do. This makes planetary and lunar astrophotography extremely different to tackle to deep space astrophotography. It is also easier, less critical and cheaper to practice to a professional standard. Due to atmospheric seeing, when you look at the planets or the Moon, even through an eyepiece, you will notice the quick shimmering. This appears to distort the detail and look similar to convecting air rising from a hot surface. Since the target is bright, you do not need long exposures - even exposure times of under a second will do. If you were to capture such exposures of the planets or the Moon while they are shimmering, you will undoubtedly capture distorted fine detail. We now see why this is very different to deep space astrophotography. With deep space objects, you have to expose for a long time to build up image brightness and in doing so, seeing becomes less and less apparent as its effects are averaged out over time (see discussion of resolution in sub-section 3.4). In planetary and lunar astrophotography however, you need a way of overcoming these seeing distortions. Alas, the laws of Physics are the laws of Physics and short of going out into space (beyond our atmosphere) and capturing your images, you have to employ a different technique. Enter the planetary CCD camera. These are essentially video cameras that have a very small CCD sensor (very tight field of view) and capture uncompressed video at a very high frame rate. For example, The Imaging Source DFK 21AU618.AS planetary CCD camera has an ultra-sensitive CCD sensor with resolution 640 x 480, capturing uncompressed video at 60 frames per second. In effect, this CCD camera is extremely sensitive, has a tiny field of view (so the image encompasses your target well) and captures 60 images per second. The technique is therefore one whereby you use a very long focal length telescope (focal ratio does not matter much as image brightness will more than suffice) with this camera recording video for a number of minutes (5 minutes or so) at 60 frames per second. The resulting video is uncompressed so in full quality and will contain a total of 5 x 60 x 60 = 18,000 images (60 frames per second for 5 minutes). The shimmering of your target is quick, due to atmospheric turbulence, but at 60 frames per second you can bet that in those 18,000 images, you have captured several hundred instances where coincidentally, the atmosphere was perfect, giving you an incredible view of your target. Software such as RegiStax can process this video to find the best images and average them together to produce a single, final result with tremendous definition. Though the 640 x 480 resolution may seem disappointing, in actuality you will quickly realise that even with a very long focal length telescope, planets may appear small in higher resolution images and you will end up cropping them. As for the Moon, this is not an issue because you can simply record the Moon in small segments and later make a much higher resolution mosaic of the entire visible lunar surface. A low resolution is also needed to ensure the camera can process the data coming in at a very high frame rate, and transmit this via the USB interface to your laptop. If the CCD sensor were of high resolution, say 1920 x 1080, nor the camera or the USB interface would cope with extremely high frame rates. This is something to note because you will find higher resolution planetary CCD cameras out there but you will notice the reduced frame rate. Frame rate is more important than resolution for planetary and lunar astrophotography and so it is better to have a planetary CCD camera that records at 60 frames per second in a 640 x 480 resolution, than one with a higher resolution but lower frame rate (unless your atmospheric seeing is tremendously good). Computing technology is computing technology however and I would personally expect this problem of data transfer rate to quickly disappear with the advent of USB 3.0 and faster interfaces. Choosing the right camera for astrophotography depends on a number of factors, as these things always go. Not only does the kind of astrophotography matter, but also how much you are willing to spend, what kind of field of view you are looking for (depends on what telescope you have as well! ), what kind of resolution you are aiming for, etc. Below are a set of general factors to consider. 1. Area of Astrophotography: Principally speaking, do you want to go into planetary and lunar astrophotography or deep space astrophotography? If the former, a planetary CCD camera is for you. If the latter, either a DSLR or an astronomical CCD camera is for you. 2. (Deep Space) Image Quality: Knowing now how a DSLR compares to an astronomical CCD camera, you need to think about which one you wish to pay for. Ultimately the DSLR may seem easier to operate but they are both very similar and there is no need to shy away from astronomical CCD cameras unnecessarily, thinking that they are too complicated (because they are not). In fact, astronomical CCD cameras have less to deal with (no ISO setting, for example). The quality of your images will be much greater with an astronomical CCD camera, unless you invest in a customised DSLR but the cost of those is already tending toward the cost of an astronomical CCD camera so there is little point. 3. Field of View and Resolution: This is a subject that has to be looked at alongside a telescope. It helps to look at the size of various targets of interest and seeing how different telescope and CCD camera combinations see these targets in terms of field of view and resulting resolution (check out Stellarium or CCDCalc). 4. Monochrome or Colour: This is irrelevant for DSLR users but for those looking at astronomical CCD cameras (deep space) or planetary CCD cameras (planetary and lunar), it is an important subject matter. If the increased spatial resolution, increased sensitivity and ability to combine images differently (and image different parts of the spectrum - very important for those getting into deep space astrophotography) matters to you, and you are happy with the extra cost of having to buy the filters and deal with slightly more post-processing, then monochrome is for you. Keep in mind that professional astrophotographers stick to monochrome astronomical and planetary CCD cameras for these good reasons. With the above information, one should be able to make a more informed decision of the camera to buy. The following are recommendations to date (24 / 01 / 2014) of cameras for astrophotography. These vary in price and capabilities but meet all four points above in a varying fashion. These are only some as there are of course more in the market.